Notepads is rated 5.0 out of 5 by 12. PrintPlace.com lets you design your own notepads and print them the same day. "I cannot imagine doing business as well without PrintPlace. Plus the customer service is outstanding!" Rated 5 out of 5 by Courtney from Quick and Easy Made custom notepads for our office, with our personalized logo and it was extremely easy and quick. Not to mention the delivery was fast! Rated 5 out of 5 by Solar Soccer Club from Great customer service! The helped me get several 100 last minute custom notepads made in 24 hours! Rated 5 out of 5 by angie08899 from Came out perfect! I was just getting a few pads for our game prototype, I wasn't expecting such great quality,, They look perfect! 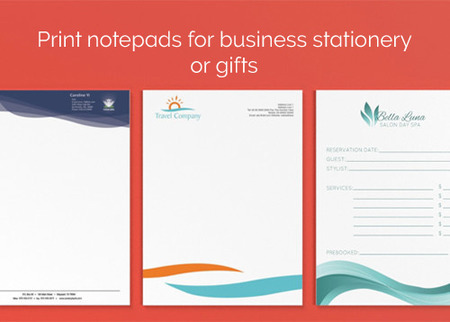 You can print personalized notepads online for business or personal memo pads. Designed with your company logo, they are ideal for interoffice correspondence, checklists, and notes. Custom notepads are also useful as a POP tool for entry forms, coupons, or rebate pads. They can even be printed for personal or business stationery or designed for customer gifts. Uncoated paper is the best type for writing with a ballpoint pen, but gloss text paper stocks are also available if you want your colors to pop. Our notepad layout templates ensure your artwork prints correctly. Find the size of your notepad and preferred design program. Then download the file below. Follow the specifications provided for an accurate print job. Custom notepad printing is just more fun. Once you receive them in the mail, they’ll come in handy for any company since business notepads are useful in a variety of ways. Use them internally or as promotional items or giveaways. Think about your company’s specific needs to personalize notepads with check lists for services such as pest control, house cleaning and lawn care. Create a custom grocery list for your restaurant, or an end-of-the-day checklist for your shop. How about creating a suggestion box for employees with a tear-off pad of submission forms? For personal or business pads, keep your branding and company information at the top and bottom edges to allow plenty of room for writing.